The Monogram Labels feature your first initial enlarged in a shape of your choosing, followed by your full name. Choose from simple shapes like circles and squares or have fun with a crown or flower shape. You can also choose your font and background colour or colour palette, but all the text is in white to make your name and initial pop! These are a great style for an older child or adult as they are sophisticated yet fun. They are also perfect for sport and university needs since they have that Varsity vibe. If you’re in a hurry and need a clothing label solution, Stick On Clothing Labels are a must. They can be stuck on temporarily and then ironed or sewn down later once you have more time. 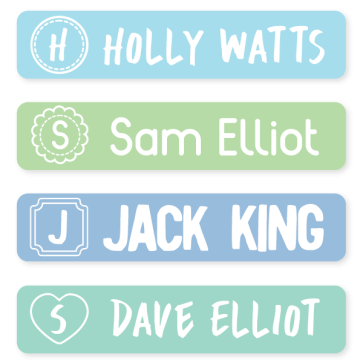 Whether your child has a last-minute sleepover, or a new school year or holiday has snuck up on you, you can use these labels and then stop worrying about losing everything! They are made from a woven material that sticks to fabric but can also be sewn on without ripping or fraying. Large Labels are impossible to miss, and therefore impossible to be misplaced! They can be used on books, sports equipment, drink bottles, and more. Large labels are perfect for travelling as they will make it easier for you to spot your gear at the luggage carousel. The larger size is also great to help nursing home residents identify their items quickly, or helpful for younger kids learning to read. Stuck On You is the original label company and our reputation was built on quality. Our clothing labels are safe for washing machines and dryers. Stick On Clothing Labels have a durable backing and will stay stuck until you are ready to permanently iron or sew it to your garment. 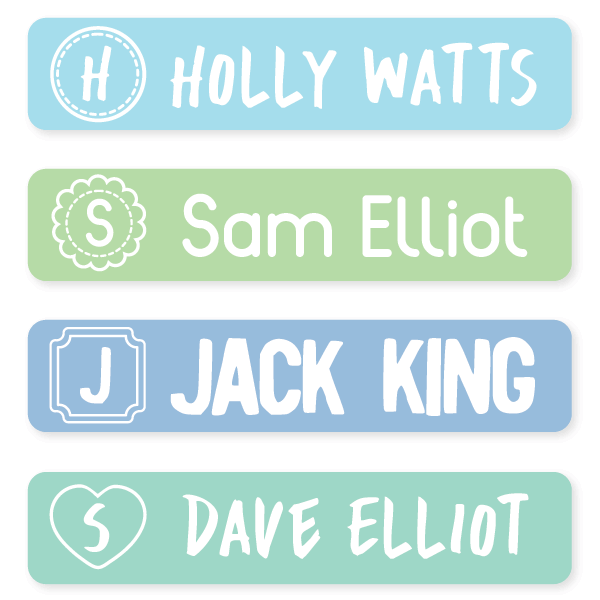 Our clever website allows you to type in your child’s name, choose a colour combo, pick a font then select a shape for your child’s first initial. Once you’ve placed your order, our team will begin creating your personalised name label and dispatch it straight to your door.